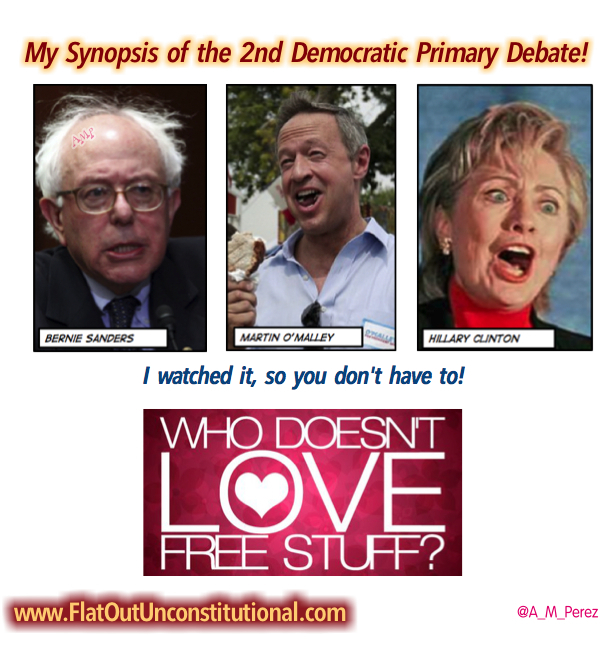 2nd Democratic Debate – My Synopsis! Watching this debate in slow motion, with a lot of rewinding, so that I could catch everything that people may be interested in was excruciating. I can’t stress enough how much I suffered sitting through this. It took 6 long hours of my life. Please be kind and do one small thing that will take only a few seconds, so that this will have been worth my time. Please share this with others, so that many may read it and I didn’t write it in vain. At the bottom are buttons for sharing to Facebook, Twitter, and many other places. I really appreciate it! Now, take two Excedrin as a preventative measure against the headache you are about to receive and read my synopsis of the Democrat debate! The three candidates in the Democratic Primary Debate are Bernie Sanders, Hillary Clinton, and Martin O’Malley. They began with opening statements about the Paris attack. Bernie claims that all Americans were shocked. I wasn’t shocked. Anyone who was shocked is ignorant. He then said that people are working longer hours for lower wages. No they aren’t, they’re either out of a job or they’re working shorter hours to avoid Obamacare. Hillary wants to root out jihadist ideology. She must not know where to find it. Martin said that this isn’t the new face of conflict and warfare in the 20th century, it is the new face of conflict and warfare in the 21st century. No Martin, this is the old face of conflict and warfare that has gone on without a break since the 7th century. They bickered about the best way to pass the buck to other countries, so the U.S. can lead from behind. Martin rattled off a list of middle eastern countries that he says are a mess. Asked if we are at war with radical islam, Hillary said, “I don’t think we are at war with Islam. I don’t think we are at war with all muslims. I think we are at war with jihadists.” Hillary, all muslims are jihadists. Jihad is Islam. The stage of jihad they are performing of is the only difference. When asked over and over, she refused to answer if we are at war with radical Islam. Martin said that we will beat ISIS because of of our “moozlim” American neighbors. He said they are our first line of defense. Hillary was nodding. Can someone please point to any “moozlims” who have stood in defense against a single muslim terrorist attack? Waving his hands around like only he and John Kasich can, in one breath Bernie slammed our military spending, our nuclear arsenal, told us the Cold War is over, and that the United States has the moral responsibility to take in muslim refugees. Martin O’Malley couldn’t be left out, so he said that he was the first person on this stage to say that we should accept the 65,000 Syrian refugees. Hillary claimed that she also said we should take in increasing numbers of refugees, the administration said 10,000 and it was her who said we should go to 65,000. Nancy Cordes, another debate moderator, listed a bunch of freebies that these candidates want to hand out, such as free community college, forgiving college debt, capping prescription drug costs at $250.00 per month, mandatory paid family leave, increase social security benefits and spend a trillion dollars on infrastructure. I thought Obama was going to build roads and bridges with shovel ready jobs? She asked who is supposed to pick up the tab? Hillary said that you can go to her web site and read the details, but she will tax the wealthy more, close corporate loopholes, and end deductions. Martin claimed that he already stopped college rates from rising in Maryland by raising taxes on the top 14%. So it isn’t just the top 1% they’re going to steal more from. Bernie said that in the past few years wealth redistribution went the wrong way and trillions of dollars went from the middle class to the top 1/10th of 1%. Math must not be his strong suit, because the entire top 1% is estimated to only have a total of one trillion dollars. When asked how high his tax rates would go on high earners, Bernie said that he hasn’t come up with an exact number yet. Cordes said to Hillary that health care deductibles have risen 67% over the past 5 years and asked if this isn’t something Obamacare was supposed to address. Hillary said that she believes we have made great progress as a country with the Affordable Care Act. Bernie said, “I am on the committee that helped write the Affordable Care Act. We have made some good progress.” This debate must be transmitted from the Bizarro Universe. He said that he enabled people to buy breast cancer drugs from Canada instead of the United States, so it would be cheaper. In other words, he willfully harmed U.S. economy in favor of a foreign economy. Another debate moderator, Kevin Cooney asked Martin O’Malley regarding immigration reform, if he is willing to compromise with republicans by securing the border first? He said that if more border security and deportations were going to bring republicans to the table, it would have happened a long time ago. Did they build a wall without telling me? He called Donald Trump an immigrant bashing carnival barker and the sheep in the audience applauded. He said that net immigration from Mexico last year was zero. In all fairness, the 80,000 or so measle ridden children Obama bused in who were followed by their families, were not from Mexico, but from other Latin American countries. Martin said we need a pathway to citizenship for 11 million illegals. Cooney mentioned that Hillary said she would go further than Obama with executive action on immigration reform and asked her how she could do that with the legal problems Obama is facing over his actions? Hillary said that Obama appealed that to the Supreme Court. Her reading of the law and constitution convinces her that the president has this authority with respect to dreamers and their parents. I can’t find anything of the sort in Article 2. She also said that we need a path to citizenship for illegals and that net immigration from Mexico and the south has zeroed out. She said she met and worked with dreamers. This is admitted law breaking. Kathie Obradovich took the question to Bernie but asked why he says illegal immigration is a wage issue. She said that Bernie wants to raise the minimum wage to $15.00/hr everywhere in the country, but the President’s former Chair of the Council of Economic Advisers, Allen Kruger says this will lead to job loss, so what level of job loss would he consider unacceptable? He said that all government policies come with some level of consequences and that millions of Americans are working 2 or 3 jobs, because their wages are too low. He rambled on about living wages and single moms. Obradovich reminded Bernie that he just said there are consequences and asked if job losses are acceptable consequences. Bernie said that the reason real unemployment is 10% and African American youth unemployment is 51% is that workers don’t have disposable income. What? Ok, this is just off the wall crazy talk! Hillary broke in to say that she does take what Allen Kruger said seriously and that he is the foremost expert in our country on the minimum wage, but it won’t result in job loss. So she takes what he says seriously, but just doesn’t believe a word of it. She says she wants a $12.00 minimum wage. Her and Martin began arguing about it, because he wants $15.00/hr. Because Wall Street is the enemy of Democrats, Dickerson asked Hillary how she plans to rein in Wall Street if she has been the beneficiary of so many millions in campaign donations from Wall Street. She said that she will rein it in and not just the big banks. She has a comprehensive tough plan and that she went further than that. Basically she said a lot of words, but never said a thing about what she will do. Bernie said, “Not good enough!” He asked why Wall Street has been the major campaign contributor to Hillary over her entire career. He started calling for the breaking up of all Wall Street companies. I don’t know where the Constitution grants authority to the federal government or a president to break up companies. I can’t find it. He went on about how he is the only candidate not taking big money donations for his campaign and he has only taken small donations from 100’s of thousands of people. Hillary got angry and said that Bernie used his answer to impugn her integrity. She claimed that she has 100’s of thousands of donors too, mostly small and mostly women. She said that she represented New York on 9-11 when we were attacked and that we were attacked downtown where Wall Street is. And she spent a lot of time and effort helping them rebuild and that it was good for New York and the economy. Using her “What difference does it make scream,” she screeched “It was a way to rebuke the terrorists who attacked our country!” Then she said that her proposal goes after all of Wall Street, not just the big banks. Bernie replied by saying that it’s easy to talk the talk. Martin O’Malley got his say and said that Hillary’s proposal was called weak tea by many and that’s what it is, weak tea. On to the topic of guns, Dickerson expressed that Clinton has said that Bernie is not tough enough on guns, but basically he now supports the same things she does, so asked her what the difference is. She said that since they last debated in Las Vegas, nearly 3,000 people have been killed by guns, 21 mass shootings, 200 children killed, and said this is an emergency. Ok, this was pulled out of thin air and is a bald faced lie. 21 mass shootings since the last Democrat debate? That’s almost 1 mass shooting per day! All shootings are way down according to the CDC and FBI. Gun ownership is way up. There is no emergency. Hillary Clinton is pandering to the ultra left wing haters of liberty. Bernie went on a rant about needing to give care to mentally ill people who are suicidal or homicidal. Then Martin said that we are the only nation who buries as many people from gun violence as we do. Then he turned to Hillary and said that she has been on 3 sides of this issue. In 2000 she ran saying that we needed federal, robust regulations (on guns), then in 2008 she was portraying herself as Annie Oakley, saying we don’t need those regulations on the federal level, and now she’s coming back and saying we do need them. That was probably the first truth told all night in this debate. Dickerson reminded Bernie that he has said that he will bring about a political revolution. He said that there is a conservative revolution going on in America right now, as John Boehner knows and as democrats know who have lost in state houses across the country, so how does he deal with that part of the country, the revolution is already happening, but on the other side. I am shocked that this was mentioned in a democrat debate. Bernie’s answer is that he’s going to bring a political revolution that brings working people, young people, senior citizens, and minorities together. He said that the majority of people want his ideas, but that congress is compelled by bad campaign finance laws, so they stop all of his socialist, utopian ideas. Dickerson quoted Hillary’s figure of 92% of Americans supporting background checks along with mass shootings, emotional support behind it, and the full force of the Obama administration behind it, yet it has gone nowhere. He said that’s the model Bernie is talking about and nothing happened. Bernie said that what we need is leadership in this country that revitalizes American democracy. Bernie, the United States is not a democracy. You’re in Congress, this is something you should know. Kathie Obradovich brought up Bernie’s comment in the last debate that he was sick and tired of hearing about Hillary’s e-mails. Then he told the Wall Street Journal that questions about Hillary’s e-mails compromising security were valid. So which is it, is it an issue or is it not. Bernie’s answer gave us a replay of the last debate. Again he said he was sick of hearing about her e-mails while Hillary stood beside him cackling. He rambled on about the middle class disappearing and that the U.S. has more people in jail than any other country. Dickerson said that there is an FBI investigation going on regarding Hillary’s e-mails and asked if she can satisfy democrats who might worry about another shoe dropping. She laughed and said that she thinks that after 11 hours that’s pretty clear. Then she changed the subject and said that we have to talk about other issues. She said all of us support Planned Parenthood, believe climate change is real, and want equal pay for equal work! Dickerson changed the subject to race relations and said to Martin, that police are afraid to enforce the law, because they’re worried about being caught on camera, so what would he do about this as president. Does anyone read the Constitution at all? This isn’t a federal issue. Not in the slightest bit. Martin’s answer is that we should do more of what saves and redeems lives and stop doing the things that don’t. Then he said that black lives matter. Regarding race relations, Bernie went on about all of the blacks in jail and and said that we have to let states legalize marijuana. Well, I agree that it is a state matter and that the federal government has no enumerated authority to pass drug laws, but I don’t know why Bernie equates legalizing marijuana with black people. Hillary was asked if the Missouri University activism should occur in other universities around the country. She said that she was a college activist in the 60’s. She said this reflects the deep despair that young people, particularly of color have. Yes, being in college and having to attend classes every day can cause so much despair! How do these college students live with such grueling burdens? Hillary went off the subject and started talking about blacks getting shot all the time, one who was shot by a white guy for not turning his car radio down. She said that she met the mothers of Eric Garner, Tamir Rice, Mike Brown, and Trayvon Martin. All criminals who died during the commission of a crime with the exception of Tamir Rice, whose death was a mistake, but the events leading to it were understandable. He pulled a fake gun on a cop. Nancy Cordes asked Bernie about his desire to scrap Obamacare and have single payer, putting the 1 trillion dollar healthcare insurance business out of business. He said it won’t happen until we have campaign finance reform and get rid of all these Super PACs and the power of the insurance companies and drug companies. He went on his regular rant against American capitalism and said Medicare for all. Dickerson asked what the candidates have experienced in their lives that suggest they have been tested and can face that inevitable challenge. With the exception of 3AM phone calls, I assume. Benghazi never gets brought up. Hillary’s answer was that she was part of a small group who had to decide whether or not to advise the president whether or not go go after Bin Laden. So, not making a decision herself, but being part of a group that would decide whether or not to advise someone else to actually make a decision about going after the 9-11 mastermind, really tested her. It must have caused so many sleepless nights for her. Hillary said it was an excruciating experience. Martin O’Malley said that he doesn’t think there is a crisis at the state or local level that you can point to and say, “therefore I am prepared for this sort of crisis that any man or woman who is the Commander in Chief of our country has to deal with.” But as a mayor and a governor he learned certain disciplines that are directly applicable. Bernie said that he had the honor of being Chairman of the U.S. Senate Committee on Veterans Affairs for two years. Wow! Making sure that vets get shafted each and every day must have been a challenge! He said he met with an extraordinary group of people from World War II, Korea, and Vietnam. He said he proposed the greatest legislation ever to help the vets, but could only get 2 republican votes on it. I remember that, it was a pork bill that had almost nothing to do with vets, but was called “The Vets Bill.” Remember, the question was about if they had ever been tested. The closing statements made me drowsy. Martin O’Malley: If you believe that our countries problems and the threats that we face in this world can only be met with new thinking, new and fresh approaches, then I ask you to join my campaign and go to my web site. He rambled on a bit and said we have to identify threats before they back us into military corners. Oooh! Oooh! I know what our threat is! Hillary Clinton: I’ve heard a lot about me in this debate and I am going to keep talking and thinking about all of you. I think the president’s job is to do everything possible, everything that she can do to lift up the people of this country. Starting with our children and moving forward. Go to my web site. Bernie Sanders: This country has more income inequality than any major country on Earth. We have a corrupt campaign finance system, dominated by Super PACs. We are the only major country on Earth that doesn’t guarantee health care to all people. We have the highest rate of childhood poverty. I don’t think Bernie knows what poverty really is. We’re the only country that doesn’t guarantee family leave. That’s not the America that I think we should be! Go to my web site. To sum this up, the candidates once again argued over who had the best way to give away the most free stuff and everything great about America is bad, so we need to import our enemies by the thousands and give them welfare checks! We even got a token Bush blaming. If any of these three are elected President, the United States of America is doomed. Previous France Ignored Every Warning and was Predictably Attacked! The start of this fiasco was delayed b/c of the breaking news from Paris, so I tuned out and missed it. So this synopsis was my only exposure to it. Seeing it written down w/o all the verbal and physical theatrics makes it even more painful. The thought of any of these defectives running the country is terrifying. Thanks for doing all our dirty work and sparing us the pain.. I heard Pay Per View had their big championship fights on during the same time as the debate. I guess they weren’t worried about competition. Almost no one has watched the youtube uploads of the debate. Thanks for taking the time to write this, Anna. I always appreciate your views. Thank you for taking the time to summarize – I know it must have been excruciatingly painful! Thanks! I had to open a new bottle of Excedrin to get through it!